It reminds me of a powder compact but in fact it's a simple easel card! I used my Circles framelits to cut a round card base, folded the front in half and attached another circle to the half to make a new card front. 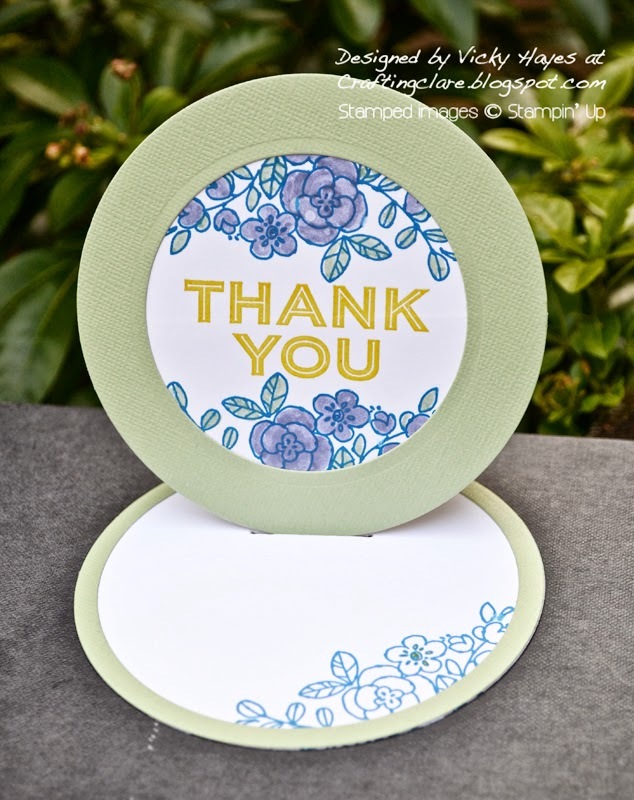 The fabulous punchy 'thank you' from Simply Celebrate was stamped in the centre of the card front and embossed with clear embossing powder before it dried. ... and these were stamped and left uncoloured on the inside of the card, where you'd write your message. I wanted a CAS way of keeping the card propped open so I poked two holes with my piercing tool and joined them up with a couple of cuts of my craft knife to make a small slot. I was probably put off practical jokes in primary school when one naughty boy daringly put a snowball on top of the door to fall off on our teacher when she came in. In fact when she opened the door the snowball stubbornly remained balanced on top of the door and there was an audible intake of breath from the class. When she closed the door, the snowball fell wetly onto her hand. She remained there, holding the door handle with the snowball on her hand for what seemed ages and when she turned to face us, she was rigid with anger. We were all punished for that boy's joke and although I can't remember the teacher's name or even her face, I have never forgotten the injustice. Could she really not share a joke with a group of small children? If not, could she not have used the situation as a chance to educate us sensibly about appropriate behaviour? What a poor role model she was! What a lovely card - I love the shape and pretty flowers! I'm not great with practical jokes either! Thank you for joining in with my challenge at Crafty Cardmakers and more... I really like the colours you have used for your card - nice to see a different shaped easel, too! What a lovely bunch of colours Vicky. Super card! Oh, an easel card, what a nice idea! I love the beautiful flower stamp and this very well chosen graphic sentiment! Thank you Vicky, for sharing with us at House of Cards.